Love them. But hubby does not. Oh well, more for me, right? These would be perfect for serving with after-Thanksgiving turkey sandwiches. 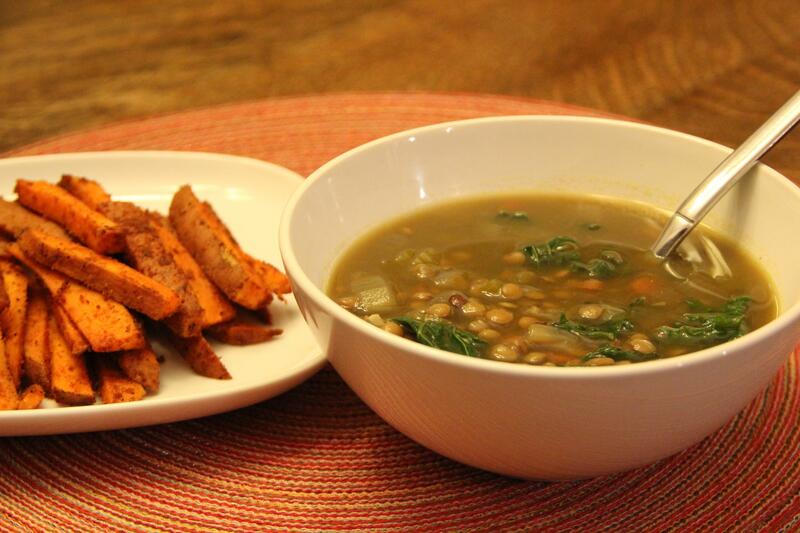 Or any old time, say, with some lentil soup, like we did this week. Preheat oven to 500 degrees. (Or the highest your oven will go, if it doesn’t reach 500. The hotter, the better chance of crispy fries.) Line a cookie sheet with foil for easy clean-up. Wash and cut the sweet potatoes to desired thickness and length. (You don’t have to peel them, I don’t.) In a large bowl, toss the potatoes with olive oil. In a small bowl, mix the remaining spices together. Then sprinkle the potatoes with the spice mixture, stirring well until all potatoes are covered. Spread potatoes out evenly on cookie sheet. Use two sheets if they are crowded. The more space they have to “breathe”, the crisper they will be. Depending on how thick you cut your fries, the longer they will need to bake. Start with 10-15 minutes, stir them and check to see if they are tender. Bake until tender. Also, check out Elise’s recipe over at Simply Recipes and the hints from her readers on other ways to help crisp up your fries and dipping sauce ideas. These seasoned fries I prefer to eat plain. 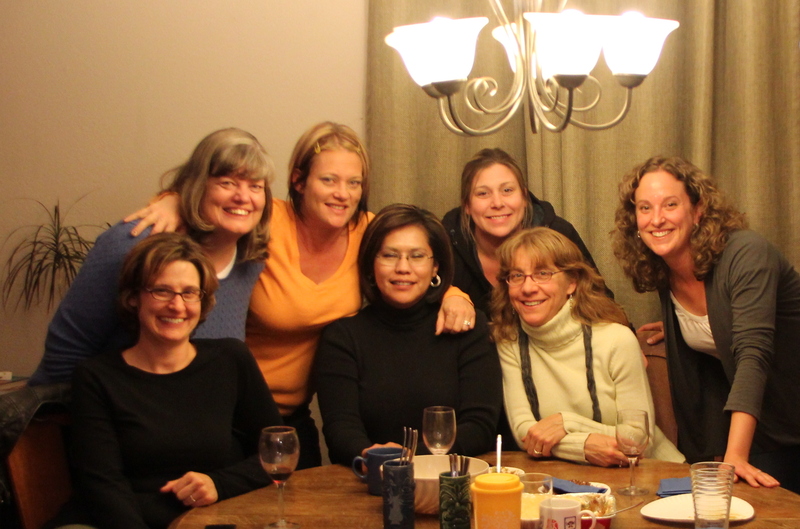 On Friday evening I hosted a Gluten Free Gals get-together. I had suggested a theme of holiday dishes to help inspire everyone for the upcoming holidays and so I chose to make two of my standard Thanksgiving dishes. Wild Rice Stuffing and this Apple Crisp. My grandma made this for me for my very first gluten free Thanksgiving sixteen years ago. And we’ve been making it ever since. It is easy, with few ingredients, and tasty. My kind of recipe. Preheat oven to 350 degrees. Grease a 9″ square baking dish (with butter, oil, whatever you choose to use). Pour the lemon juice directly into the pan and add the apples as you slice them. Toss the apples periodically in the juice to prevent browning. * Use any baking apple. This time I used Gala. Slice your apples according to preference. I like my apples a bit thicker so that they still look like apple slices when they are done baking. If you slice them thinner, the apples will cook down and the individual slices will not be apparent, which is okay, just personal preference. * I used brown rice flour this time. I’ve used white rice flour in the past. Other flours may work as well, perhaps even almond, for a grain-free version? Your standard flour mix will also most likely work. No xanthan gum needed. * I reduced the sugar by two tablespoons this time around and I think it could be reduced even more. Play with it. * I used grapeseed oil this time in place of the butter and it worked well. I would imagine that a dairy-free margarine will also work. 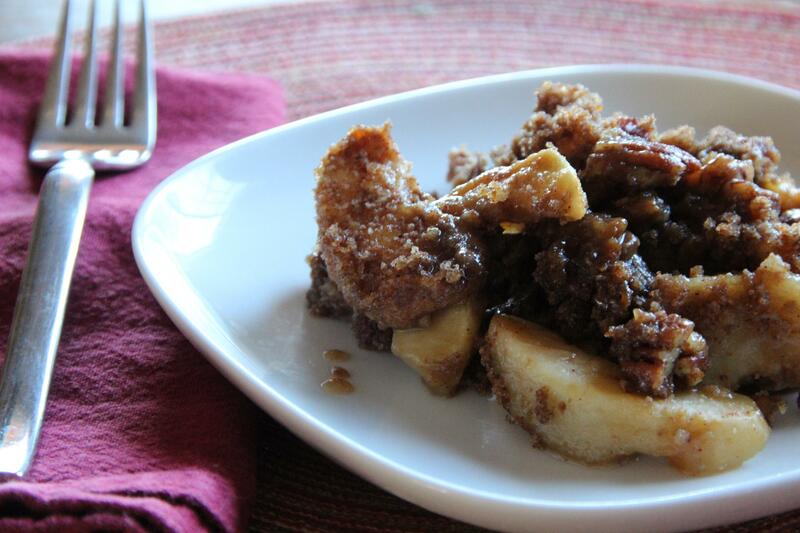 This recipe is cross-posted over at Thanksgiving Favorites from Kim at Cook It Allergy Free. Be sure to check out all the links!